The RAAF has completed its Philippines Assist mission with the return of two 37SQN C-130J Hercules to their Richmond home base on Friday. 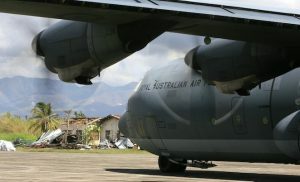 The two C-130Js plus a 70-strong Air Component Coordination Element based at Mactan Airport were the RAAF’s main contributions to the Australian government’s Operation Phlippines Assist mission to provide disaster relief support following Typhoon Haiyan, which struck the Philippines in November. Other RAAF support included C-17 airlifter flights and a Combat Support Element forward deployed to Ormoc. Over a period of five weeks the RAAF completed over 250 flights transporting over 2,270 tonnes of relief supplies and medical aid and 5,800 passengers, including 3,500 internally displaced Philippinos.